Since 1979, Reed Financial Group has been helping local retirees and soon-to-be retirees build sound financial strategies that are designed to help provide them with security, confidence and peace of mind in retirement. As Retirement Specialists, we focus on helping our clients build comprehensive financial strategies that incorporate income planning, Social Security maximization, tax minimization, as well as planning for the unexpected and the inevitable. As Investment Advisor Representatives, we believe that security in retirement comes with the knowledge that you have a sound financial plan that is designed to help you build, grow, and enjoy your life's savings, while working to ensure your financial future. As a family owned and operated company with over 35 years of experience in risk management and financial planning, we pride ourselves in helping our clients retire with the security and confidence that comes from knowing that they have a sound financial plan that is designed to protect them today, tomorrow and long into the future. 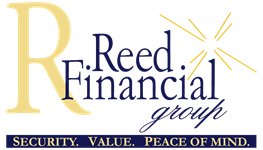 Discover the Reed Financial Group difference. Discover what it means to have a team of financial experts advocating for you and working to protect your assets as if they were their own.